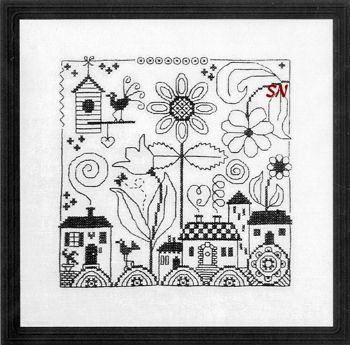 This is a 6 x 6 piece stitched with regular shades of DMC floss.I think it'd be cute in a little girl's bedroom... change the hair and house colors... and stitch her name so it meanders through the flowers. This is presented as a chart. 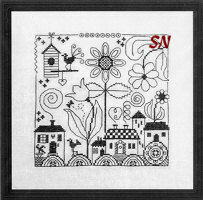 Something Fun to Color With Floss! 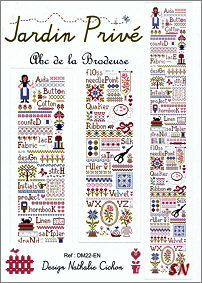 Jardin Prive has a pair of new designs that I fell in love with! They are delightful! 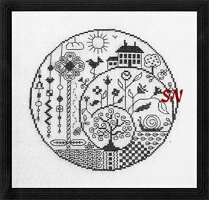 Only black lines.. you can stitch them just as they are, color the lines, or COLOR between the lines! Offered as charts, they measure approx 100 stitches each. What do you think? Wouldn't just a PORTION of one be pretty as a pin cushion??? 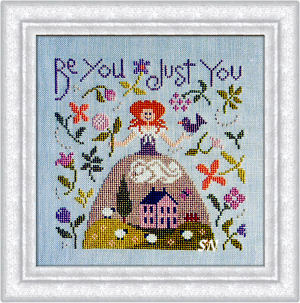 Stitch to your edges... how beautiful can yours be... and different from your friends?! 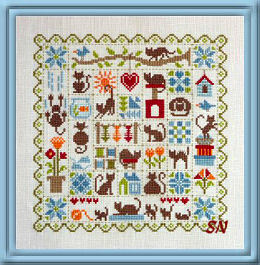 We have several new designs by Jardin Prive... a pair of long skinnies are showcased here... we have a third sheep medley design, cat lovers, a cute spool-of-thread piece, and a neighborhood of cute houses. Make sure to click through to our page that shows them all... cute stuff! Everything is presented in chart format and coded for regular DMC floss. 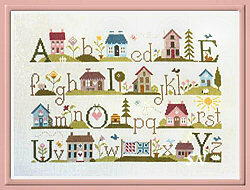 This is an over-the-top cute needleworker's alphabet by Nathalie Cichon of Jarden Prive. With a stitch count of 76 x 565, this will finish a whopping 5-1/2 x 40-1/2 on 14/28... all the way down to 2-1/2 x 20 over one on 28ct! 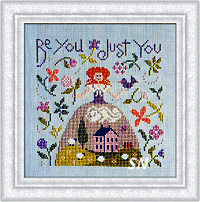 You choose your fabric of choice to make this YOURS! 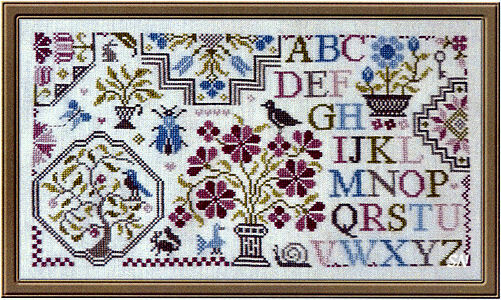 It would be awesome to split it all up and make a ton of pin cushions... there are a bunch of little motifs and borders all through this. Charted for regular DMC floss, you could add hand-dyeds, buttons, beads, charms... anything you want. 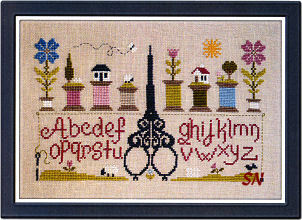 Just such a fun piece for a stitcher... hang it beside the door to your stitching lair! 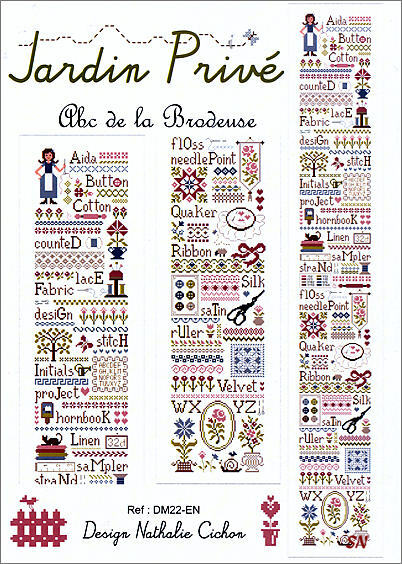 Wow... A charming 3-part set of designs by Jardin Prive... this one is horizontal... and all three parts are here. Stitch them together or individually... each finishes approx 7 inches high, and 6 or 12 inches wide. 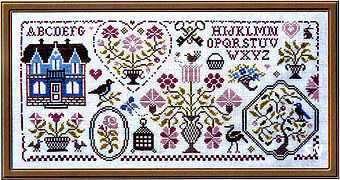 The total piece finishes approx 5 x 26 on 36ct. Charted for only 9 shades of DMC floss, the bouquets are lavish, the lettering, borders and birds... everything is so pretty together! 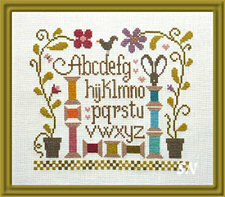 Another charming collection of designs... this one comes as a set of 4 charts. 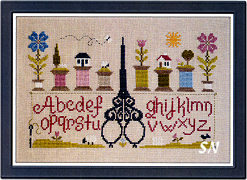 Singly, each design is different in size, together, they measure 296 x 145 -- or a charming 8 x 16 over two on 36xt. 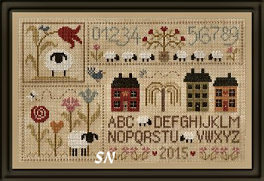 You could do this on 18ct� linen over two (like the Shepherd's Bush stockings) and use wools to make fuzzy sheep - it'd be 33 x 16! Choose whatever fabric makes you happy... we can get you threads! 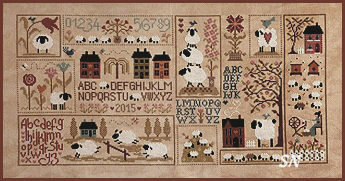 The history of sheep... I think my favorite block is the one that has them jumping the fence! 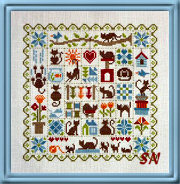 What a pretty piece full of Quaker motifs and little black kitties. 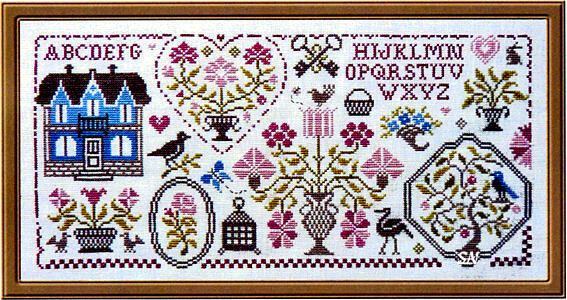 This measures 180 in stitch count or 10 x 10 on 18/36ct. 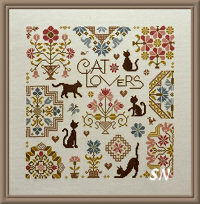 Coded for just 8 colors of DMC floss... again, add some hand-dyeds if you want, or think about stitching those cats in black Simply Wool!!! Maybe dump the words *CAT LOVERS* because you already know that you are one. 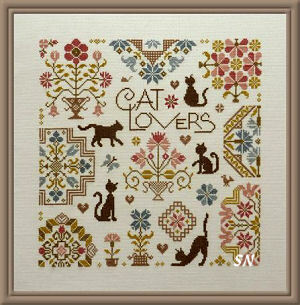 Instead... stitch your kitties names!!!!! A garden of spools! 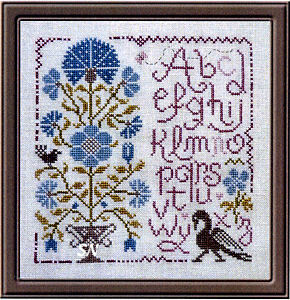 This is a fun little piece, coded for DMC... it finishes approx 5 x 6 on 18/32 count. Change the alphabet letters in here (we already know them!) and put your name in here -- like it's the entry to your sewing room! 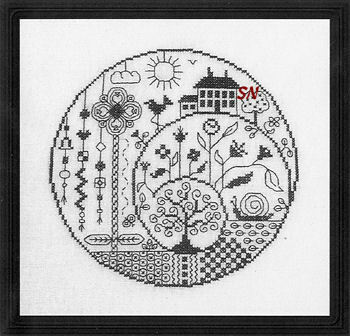 It'd be darling as the front of a sewing bag... and if you did it bitty - like over one on 28ct Lugana - it'd make a 3 x 4 PIN CUSHION!!!!! 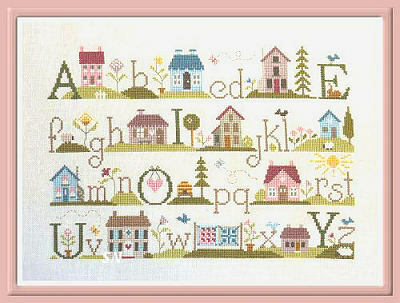 An organized neighborhood of houses... this finishes approx 8 x 11 on 32ct. I think the trees are fun, because they're all different. The houses are all too... and the little hills. Which house would you live in? Charted for DMC, might make a cute set of cushons or fobs. 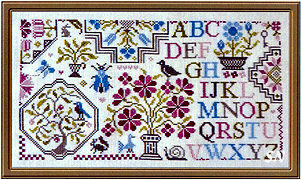 A trio of charming charts we stumbled across at the recent Spring Wholesale Needlework Market -- all three of these can be stitched on any fabric you like, and are coded for DMC floss. No special embellishments or threads called for -- that's YOUR challenge if you're up to it! 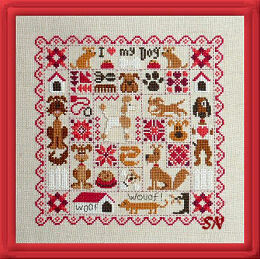 Add some beads to borders and eyes, furry Simply Wools to the animals, maybe some bitty bells for the cat collars? Some metallic to those scissors... what about Satin Stitches on the thread spools? 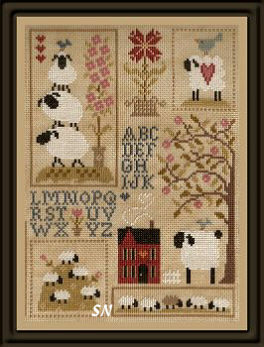 French Knots for the sheep and bee buttons??? Each of them is really cute, and full of fun design motifs. 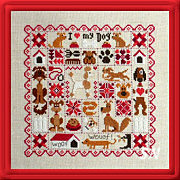 Cats and Dogs both measure 117 x 117 -- about 8-1/2 inches square on 14/28ct. The Scissors and Spools measures 143 x 86 -- so about 10 x 6. Cute!